Sailing around Guadeloupe combines French charisma and flair in a Caribbean island. Here you have the privilege of embarking on short hop relaxing sailed or long voyages to get to your destination of choice in Guadeloupe. These sailing routes are designed for intermediate sailors who are looking to experience the most breathtaking views the eye has ever seen. Along with the opportunity to absorb the cultural richness of this amazing island. Start your boat charter in Guadeloupe and go for an unforgettable adventure. If you are planning to sail without a skipper, make sure to have the necessary license at hand. Take a look at our post about licenses to be on the safe side. Day 1 of your Guadeloupe sailing experience will begin at the oh so famous Marina Bas-du-Fort. Also known as Marina du Gosier or Marina de Pointe-à-Pitre… Just to avoid any confusion! There are maybe a few too many names for this marina. Nevertheless, it is a fantastic starting point for your voyage with its warm welcoming staff, free wifi, warm showers and toilets, washing machines, tourist info and concierge services. In high season you will see that there are extended opening hours to make use of your day completely. After a morning of getting to know your charter boat and preparing for your voyage, we recommend you go for it and set sail South West towards Îles des Saintes where you can anchor in one of the most beautiful bays in the world. Although there are many moorings to choose from, our guidance would be to moor at Bourg des Saintes. It is compulsory to use the new moorings at Bourg des Saintes, looking South. Prices depend on the size of the yacht but are approximately around 13€ per day. To do the customs check-in walk up to the internet café right off the main dock. Once you’re settled it’s time to check out this mesmerising island. Îles des Saintes is perfect for those of you sailors who relish unspoiled tropical beauty, serenity and French style. In addition to its phenomenal beaches, spectacular bays, out of this world snorkelling and fascinating historical sites, this quaint island offers a charming village with great shops and restaurants. After a few hours of exploring you must be starving?! Head to Ti Kaz’la for spectacular food and an even more spectacular view. You can choose to sit inside or by the beach and listen to the waves crash against the rocks. After a lovely evening, you can either hit the hay or check out the nightlife scene that Îles des Saintes has to offer. Day 2 is going to be full of adventure! Have a hearty breakfast before heading East towards Marie Galante. 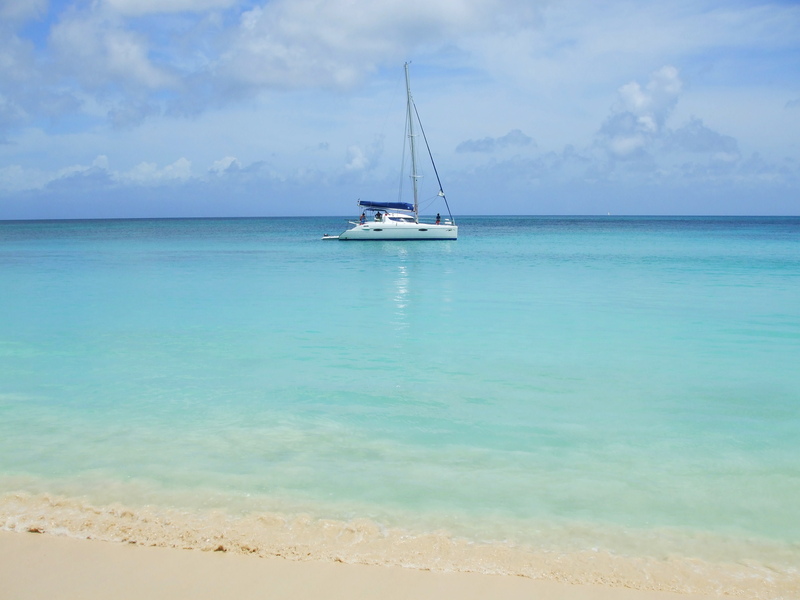 Be sure to drop your anchor at Anse Canot where you can enjoy a variety of water sports. Anse Canot is an isolated crescent shaped beach which can only accessed by boat. This beautiful beach shouldn’t be missed. Unfortunately there aren’t any public services apart from small concessions for drinks and mobile vendors to buy snacks. Due to the rusticness of the island and its accommodations, this little treasure has not become overcrowded by tourists. Once you are satisfied with your visit here, embark on the rest of your journey over to the magnificent Marie Galante. St Louis is the main anchorage in Marie Galante. It is not the capital, nor the main point of entry, but it has many moorings available and all the services you might need before continuing on with your charter. Once moored be sure to spend the afternoon checking out the wide range of activities available in Marie Galante. We recommend that you take a visit to the remotely located rum distillery. It has a historic setting in a wonderful old windmill. You will notice that with its rolling hills of green cane still worked by oxen and men with broad-brim hats, it’s like traveling back in time to when Guadeloupe was still a giant farm. For dinner, we highly suggest that you head to La Playa for some tasty seafood. The food is delicious and fresh, topped off by great service. What more could you want out of your evening meal? We also suggest that you book ahead to avoid waiting and disappointment. Voted one of the best restaurants on the island it’s bound to get busy! Now it’s time to get your dancing shoes on. Even in peaceful Marie-Galante, it’s possible to enjoy some nightly entertainment on the island. Dancing and musical evenings with performances by local and visiting artists can be found here. Check ahead to see who’s playing. 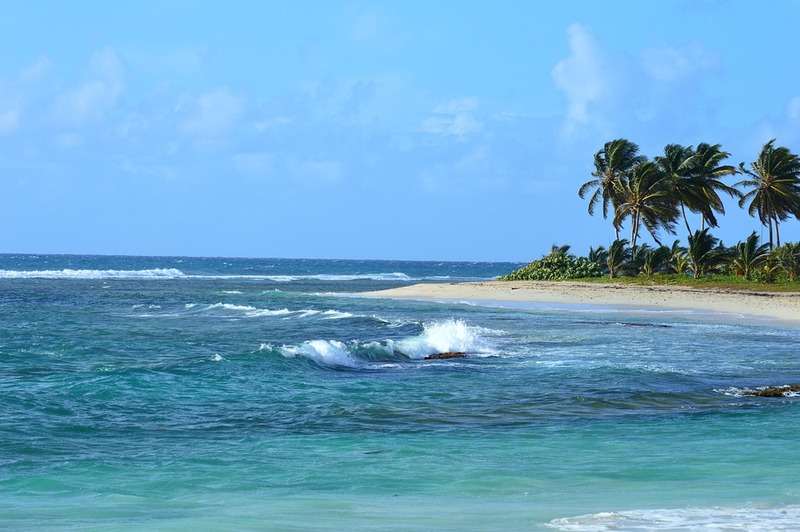 On day 3 spend a few hours in the morning enjoying the beautiful Marie Galante before heading East to Petite-Terre. Today you really are in for a treat! The buoys are free of charge to use here, so take advantage of this very rare situation. 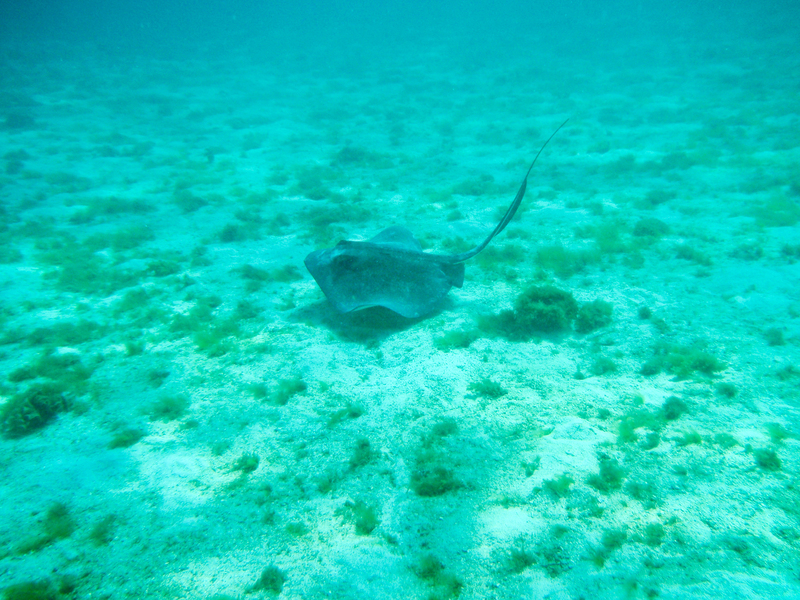 Spend some time swimming and snorkelling as the many species of fish and reefs are just fantastic. You can also find a really beautiful beach which is perfect for nice walks and watching the stars come dawn. Once the majority of the boats leave, you will feel like you are on an undiscovered island. However, if you feel like leaving this calm tranquil bubble there are many restaurants available just a short walk from the bay. Have a chilled evening ready for your sail to Gosier tomorrow! 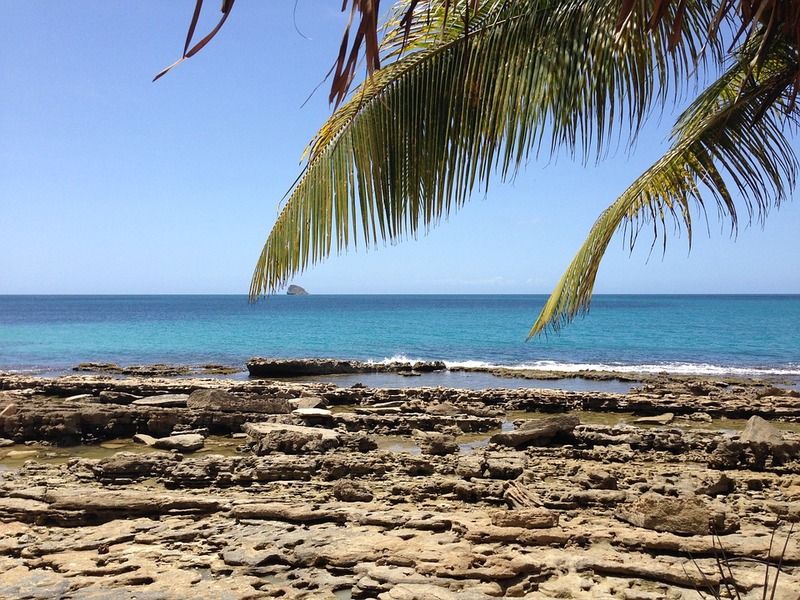 Day 4 is the last day of your charter and will take you back West to the island of Guadeloupe. You can drop off your charter boat the same place you collected it from Marina Bas-du-Fort after a lovely day of sailing. Make sure you stop at Gosier, a short distance from the main marina, and enjoy your last snorkel. Use this opportunity to soak up the magical atmosphere of the city, Pointe à Pitre – known as the New Orleans of the Caribbean. Admire the colonial buildings such as the Place de la Victoire or the Marché Saint-Antoine where you will be taken away by the smell of spices, fruits and vegetables. 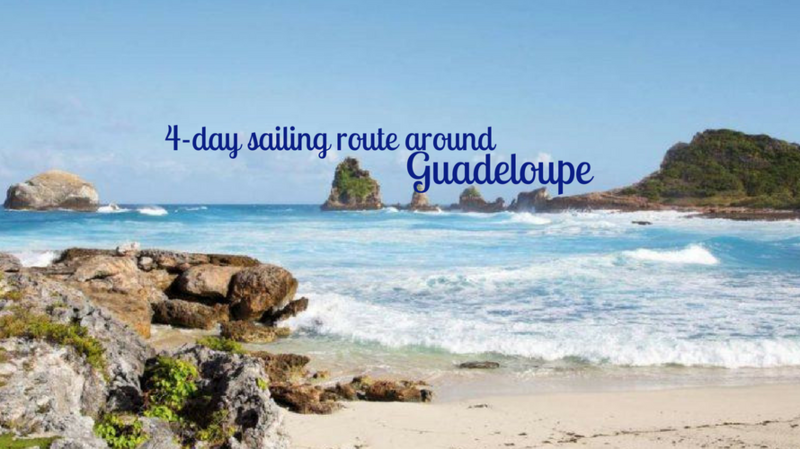 Hopefully we have provided you with a wonderful 4-day route full of sailing and exploring, so you can start planning your sailing vacation in Guadeloupe! We are sure that it will be a wonderful Caribbean experience, no matter what. 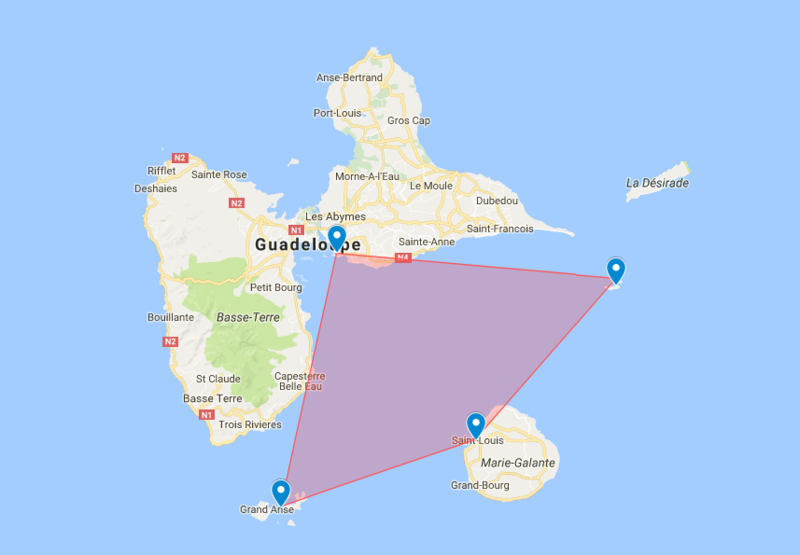 Would you like to explore Guadeloupe for longer than 4 days? Take a look at our longer sailing itineraries for either 7 days or 10 days. Or have you set sail in Guadeloupe before? Tell us about your boat charter experience and your tips for the best route around the island!